When logged in to your account, the Quotations section of our website allows you to manage your quoted pricing on Elliott products. 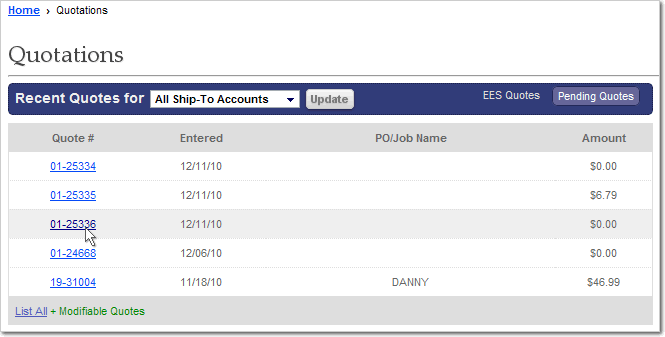 In addition to converting existing quotes into orders, you can create requests for quotes, which will proceed to your Elliott sales representative for review and return to you with special pricing, filed online as EES Quotes for use at any time in the future. Our toll-free fax line (number varies by store location). Emails to our direct email addresses (find sales contact info on your Account Overview, or by searching our locations). Data brought to an Elliott store on CD/disk, USB flash drive, or on paper. FTP link online (Contact store for details). Drop-off's at participating store locations (e.g., any Houston location). Your files are electronically saved for future reference. You have access to online blueprint services to retrieve job information (when available). EES Quotes are typically issued per each customer's BOM. EES Quotes can be sent via Fax or Email. EES Quotes provide a detailed BOM of the material quoted. Coordinated ship dates from our manufacturers. Operation and Maintenance Manuals (when needed). All job info is stored electronically for future reference. The link to Create a Quote is found at the top-right of the main Quotations page (where it is found on most other Quotes pages). This method for creating a new quote utilizes the Product Search tool, as discussed below. Click any quote number from the Recent Quotes list to view it in detail, with options to convert to order, create for an end-user (your own customer), or export view email, fax, or print. Rapid Entry for creating quotes is also accessible on the main Quotes page, on the right half of the screen (as shown below). 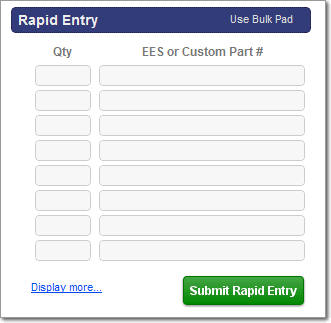 Included in the Rapid Entry box are links to use the Bulk Quote Pad or to display more fields for Rapid Entry. 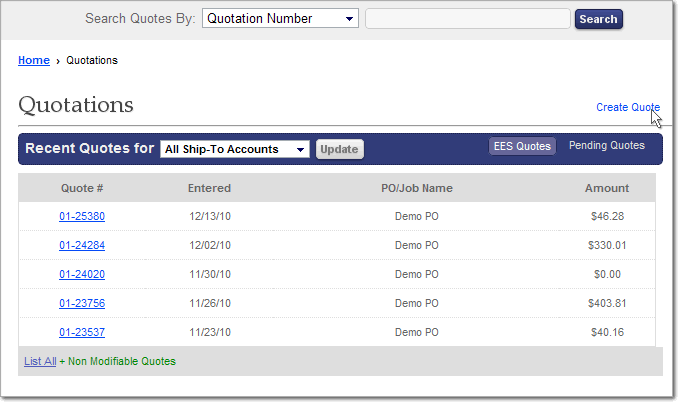 The main Quotes page also contains a Search Tool (at the top) that allows you to search your quotes by Quotation Number, Elliott Catalog Number, Custom Part Number, or PO/Job Name. Use our main search box to locate products or simply browse by product category, then specify the desired quantities and click the Add to Quote link for each item, just as you would when adding items to your cart. The Add to Quote link is located to the left of the 'Add to Cart' button (shown above). When you're finished adding items, click the "View all Items" or "View Cart" link to return to the Build Quote page, where you may save or further edit your quote. When using RapidQuote, simply enter Elliott Part Numbers or your own Custom Part Numbers in the second column and provide the respective quantities in the first column. If you know the numbers of the parts you need, or have set up your own custom part numbers, this method is highly convenient. Access the Bulk Pad for Quotes by clicking the "Use Bulk Pad" link at the top-right of the Rapid Entry box (shown above). Follow the instructions on the page and enter the part numbers and quantities you need, separating the two with either a space, a comma, or a semi-colon. Make sure each line contains only ONE ENTRY—this means only one part number and respective quantity per line. This method is especially useful if you want to copy and paste quantities and part numbers from a separate document on your computer. You may use Elliott part numbers or any Custom Part Numbers that you've loaded into our system. 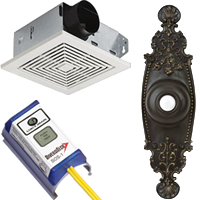 EES Quotes are quotations given specifically to you by an Elliott Electric salesperson. These may be approved RFQ's submitted here on the website, or they could be quotations you negotiated via phone, fax, or in person with your sales rep.
You may click any specific quote number from your list of EES Quotes (on the main Quotes page) to view the quote's details page, which offers exporting, ordering, and editing options. Pending Quotes include any quotes that have been created by your account in the recent past, including RFQ's that have not yet been approved by an Elliott salesperson. To view your most recent pending quotes, click Pending Quotes at the top-right of the "Recent Quotes" table on the main Quotes page. Simply click a quote number from the Pending Quotes list to view or edit the pending quote’s details (see the Quotes Details image below). RFQ’s may appear under Pending Quotes, but only if they are currently undergoing the process of being approved by an Elliott salesperson. Pending quotes that are not submitted as RFQ’s can be changed into RFQ’s by clicking Edit this Quote from the Quote Details page (shown below) and selecting "Yes" (submit as RFQ) in the ‘Quote Status’ section. Any other details may be changed on the Edit Quote page, as well. When you click on a quote number from the Pending Quotes, EES Quotes, or search results lists you are taken to the Quote Details page. Depending on the status of the selected quote, the Quote Details page provides a variety of different options. Available actions appear above the Quote Information, allowing you to Delete, Edit, Create an End-User Quote, Copy the quote (as a new quote or as a custom list), or Convert the quote into an order. The export option appear at the top-right of the page. Each quote may be emailed, faxed, or printed. The Edit this Quote link allows you to change the quote's various details, items, and quantities. You may also use the Edit Details page to resubmit the quote as RFQ, if it wasn't originally submitted as an RFQ. The Search Quotes box lets you search by Quote Number, Elliott Catalog Number, PO/Job Name, or your own Custom Part Number (if you’ve loaded them into our system). You may sort the search results by clicking on a column header, and you can print or email the list of search results by using the appropriate buttons located in the upper-right corner of the page. Select an individual quote by clicking the quote number. 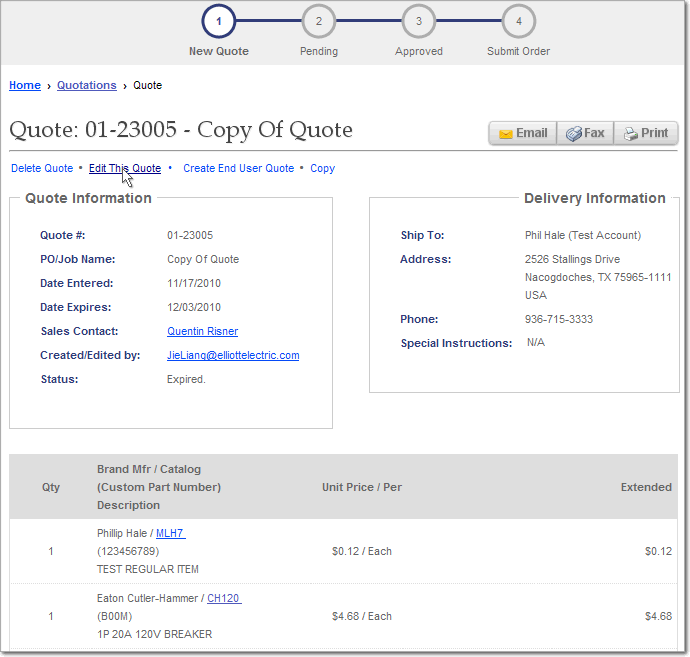 This will open the Quote Details page, which allows you to email, print, or fax the quote. You may also proceed to edit or delete the quote from the details page by clicking the link (see Quote Details).